Erie Canal Harbor is a waterfront revitalization project that reconnects downtown Buffalo to the Buffalo River and Lake Erie. The site is the former terminus of the Erie Canal in Buffalo. As Principal Preservation Planner with John Milner Associates, Inc., Peter Benton was responsible for historic preservation and interpretive aspects of the project. 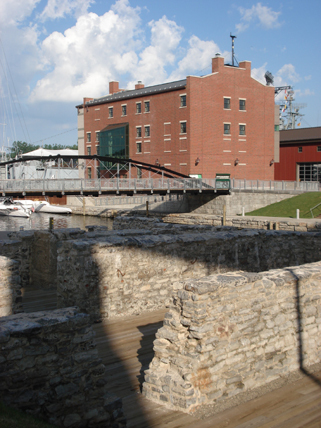 The Erie Canal’s historic connection to the river and lake was reconstructed, historic ruins were preserved, and waterfront infrastructure was created interpreting the role of the canal and the city in the nation’s history. Prime Consultant: Flynn Battaglia Architects, PC; in association with John Milner Associates, Inc.